Climate change is a pressing matter the Sustainable Living Committee takes seriously, and it will be the subject of our Earth Day service on April 28. We will share updates from Our Children’s Trust, indigenous wisdom of tribal leaders, and inspirational intergenerational quotes from climate justice leaders. On this day, we reflect on our place in the world and how grateful we are for the beautiful planet we call home. We also reflect on our responsibility, and the decisions we make on a daily basis. While the news is dire, there are actions we can all take—both individual and institutional—to address the climate crisis we now face. We can all make efforts to drive less, eat plant-based, buy local and organic, stop using pesticides, reduce waste, and reuse, repurpose, and barter what we can. We can support local efforts to reduce emissions and expand wind and solar programs in our towns and state. We can pressure institutions to divest from fossil fuel companies and invest in renewable energy. We can demand that the US government address this problem by urging our congressional representatives to endorse the Energy Innovation and Carbon Dividend Act (H.R. 763). We can do all of this RIGHT NOW. The Energy Innovation and Carbon Dividend Act (H.R. 763) is a resolution to levy a fee on companies that produce carbon pollution from coal, oil, and natural gas. The funds collected will go into a trust and distributed as a monthly carbon dividend to all American households. The dividend will help low and middle income households while providing incentives for technology innovation toward a sustainable economy and away from the destructive carbon economy. More information about the bill can be found at https://energyinnovationact.org/how-it-works/. Look for a table in the lobby after Sunday service for ways you can support this legislation. It’s time to plant some seeds, literally and figuratively! Last year we launched UUS:E’s “Peas & Love Community Garden” where we grew organic vegetables from spring through fall. Produce was shared with volunteers, community members, and the Universalist Church of West Hartford’s Food Ministry. Our first planting day of the season will be Sunday, April 7, at 1:00 PM and we need volunteers to help out! Bring your skills, energy, and positive spirit and join us in the garden. If you’re a newbie, you’re welcome to come learn with us! Please feel free to join our next Sustainable Living Committee meeting on Tuesday, April 9, at 7 PM in Room 2. Here are some that might be of interest. The first one is by our friend Mary Lawrence of Well On Wheels. Mary is a vegan chef and tells a compelling story about her journey into veganism. 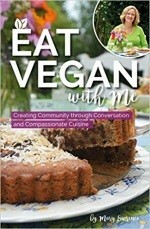 Her new book is titled, Eat Vegan With Me: Creating Community through Conversation and Compassionate Cuisine. In addition to delicious recipes and menu plans, she gives reasons to eat vegan, including for health, for the environment, and for compassion toward animals. The book is available from Amazon. Contact Rev. 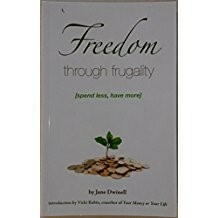 Jane at janedwinell@gmail.com with the subject “Freedom Through Frugality,” and include a mailing address in your message. 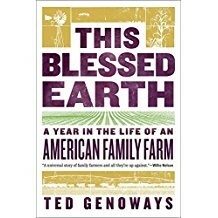 This Blessed Earth by Ted Genoways follows a Nebraska farm family for a year. This is a gripping story about one farm family whose property is in the way of the Keystone XL pipeline. The book helps us understand how farming has changed since World War II. The USDA, seed companies, chemical companies, farm equipment companies, irrigation systems, banks, and others impact how farmers grow our food. Xiuhtezcatl Martinez is a 17-year old indigenous climate activist and hip-hop artist. He has recently written a book, We Rise, the Earth Guardians Guide to Building a Movement that Restores the Planet. He is also one of the plaintiffs in the lawsuit against the federal government, Juliana v. United States. Our Children’s Trust and Earth Guardians are suing the government for violating their constitutional rights to life, liberty, and property by engaging in actions that cause climate change. SLC, RE and Rev. Josh will be highlighting this issue in a multi-gen service on Earth Day. To borrow any of these books, contact 860-646-5151 or uuseoffice@uuse.org. Citizens’ Climate Lobby (CCL) Changes Name and Meeting Place. The Manchester chapter of CCL is now The Greater Hartford Chapter of Citizens Climate Lobby. The name change reflects the growth of our Manchester CCL chapter and desire to include more people from the whole capitol region. We are now meeting at Goodwin College on Riverside Drive, East Hartford, CT. GPS set to 195 Riverside Drive—the first smaller building on the right—Room 201. We will continue to meet every 4th Thursday of the month at 7 PM. Got a Green Thumb? Even without one you can help weed and care for the gardens around UUS:E on Wednesday mornings. You may find people already there to work with you. Available in the meetinghouse lobby on the second Sunday of the month. They are organic and fair trade. If you would like to order a full case of Single-Serve Cups from Equal Exchange, contact the office at uuseoffice@uuse.org. A case of six boxes (12 cups per box) is $50. We will have boxes of six available without pre-ordering for $8.50. More information about Equal Exchange Products, click here.